This article is brought to you by Usersnap, a visual bug tracking & user feedback tool. Usersnap is used by software companies like Google, Facebook, and Microsoft as a great Jira alternative. Sign up for a 15-day free trial! Sometimes I feel a bit overwhelmed by the sheer amount of content in the field of project management. Especially when looking at the tool-side of project management. I see new tools popping up every other day. With Jira and Trello – we looked at two major project management tools, their benefits and drawbacks and most importantly their main differences. Since Atlassian, the vendor of Jira acquired Trello, both project management tools are coming from the same company. But they are still competing over the same target group. So if you’re thinking about making the switch to Jira or Trello, this article is the right place for you. Besides those two well-known project management solutions, there are a ton of great applications out there, which fight for your attention. With every tool comes yet another distraction. What is the perfect software? Requirements differ from company to company, from team to team, and even from person to person. Most modern project management solutions are split up into various sub-categories, such as task management, milestone planning, Kanban boards, time tracking, monitoring and more. 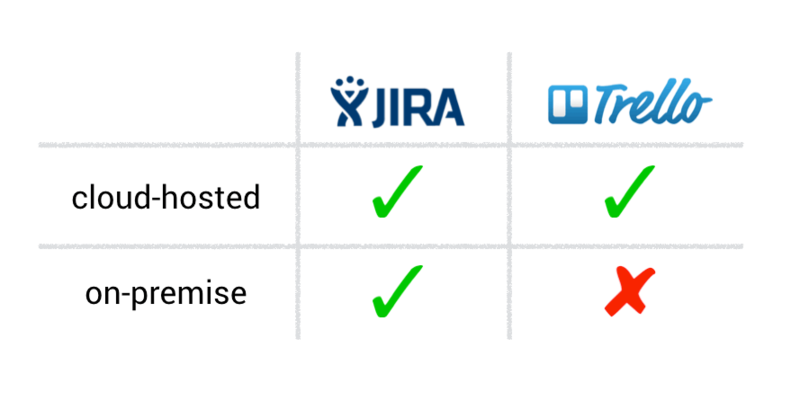 Jira is the best-selling software development tool from Atlassian. Used by a lot of tech teams it offers project planning and -tracking features. Designed for agile software development teams, Jira offers various dashboards and overviews for scrum and agile techniques. With 1,000 add-ons and extensions, Jira enables you to integrate its software with other 3rd party tools you might already use. 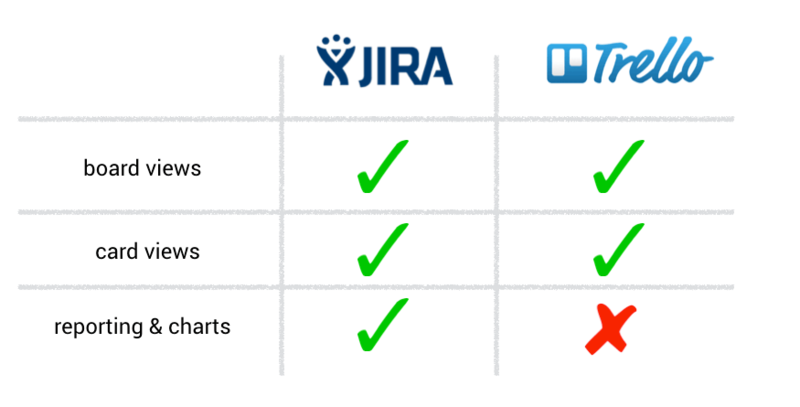 If you want to learn more about the best Jira integrations make sure to check out this article about 7 Jira integrations, which help you to optimize your web development workflow. Trello – on the other hand – is largely designed for more general usages. Trello is a lightweight project management tool, also owned by Atlassian. Designed as a Kanban board tool, you can visualize your task flow of anything from software development projects, to marketing campaigns, to holiday trips. Trello for development and design teams? No matter if you’re working for clients or not. Software or website projects require a lot of collaboration and communication. Trello is a great tool which solves that problem of managing and tracking your web development. It offers various integrations for enhancing your project experience. Make sure to check out this essential toolset for Trello. 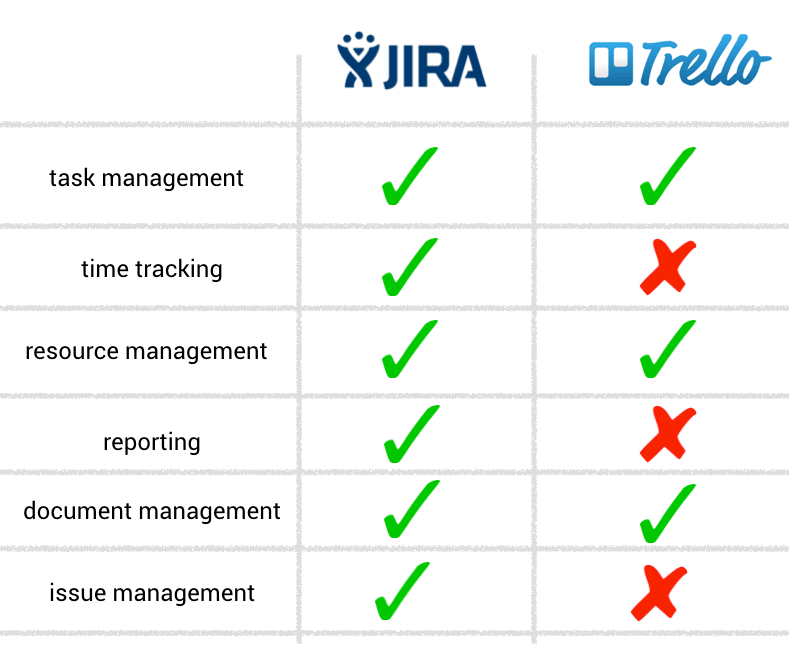 While both of them are project management tools, Jira and Trello have some key differences. Since Jira was designed for software teams, it mainly targets software builders, developers, or project managers working on software projects. In contrast, Trello has a much broader target audience, as it basically offers any kind of project tracking. So, let’s dive into it. We looked at various review sites, did our own research, and found some expert statements in the industries. When you search for Jira vs Trello, you’ll discover more than 34,000 results on Google. Wow. A lot of people seem to be interested in the topic. So what are the main differences? If you’re one of those people who just skim an article, I’d recommend taking a close look at this overview, which gives you a good impression of both tools and their major differences. Today, businesses have a lot of choices when it comes to data storage. One of these choices is using the cloud to host your data as opposed to keeping everything within your own network. There are benefits and disadvantages of both methods. And your choice of cloud vs on-premise software will depend on a lot of factors which I don’t want to address in this article. In a nutshell: If you’re looking for an on-premise project management software, Trello won’t be among your favourite choices, since it’s only available as a cloud-hosted service. On the other hand, Jira offers an on-premise solution too (besides a cloud-hosted version). A general comparison in terms of pricing is a hard thing to do. But I’ll try to make it as easy as possible. The various plans of Jira and Trello depend on a couple of factors. But most importantly, the monthly price depends on the number of users. The basic pricing of Jira starts at $10 per month. On the other hand, Trello offers a free account. As a team, I’m sure though that you’ll end up choosing better plans since both Start plans are pretty simple and limited. With agile and scrum being the leading methodologies nowadays, there’s a clear trend towards lean approaches in project management. Therefore, a project management tool must adapt to these needs and must be customizable enough to fulfill them. Both – Jira and Trello – meet these needs of scrum or Kanban and offer various board dashboards and card views for managing your team’s tasks. 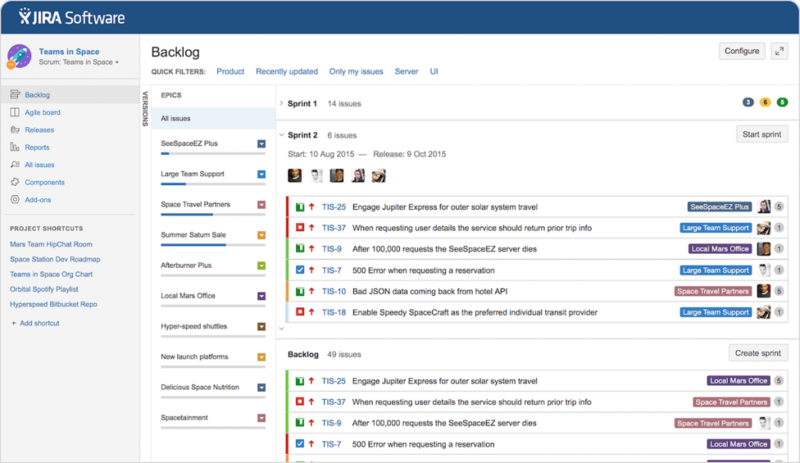 When it comes to traditional project management features, JIRA seems to be one step ahead. If you’re looking for a more comprehensive time tracking features, management reporting tools, and issue tracking functionality, you’ll probably end up with Jira. Jira, on the other hand, offers hundreds of integrations with other tools and services. 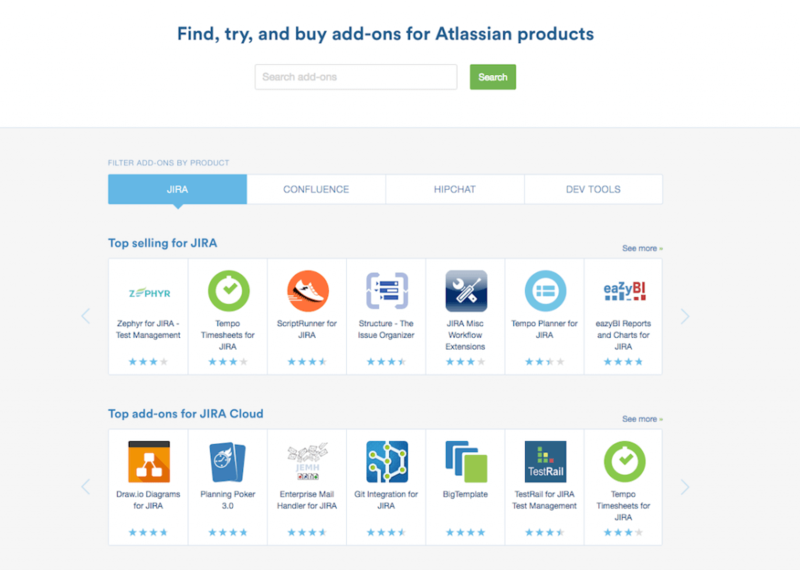 With its Atlassian marketplace, Jira is surrounded by a vivid environment of 3rd party software. If you’re looking for a comprehensive, fully-adjustable project management and tracking tool for your mid-sized software team, you might end up using Jira. Jira is the go-to tool for large-scale project and teams. However, you must be aware that onboarding time and costs might be higher with Jira, as not so tech savvy people might have a harder time using it. If you’re looking for an easy-to-use project and task management tool for your small company, Trello might be the better choice. With its simple, yet well-designed user interfaces it offers small teams an easy entry in the world of project management.